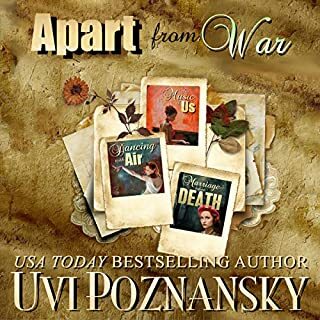 Dancing with Air by Uvi Poznansky is a lyrical tour se force set in World War II in England. Poetic, evocative, and at times langorously delicious, the new audiobook version adds even more to the sense of "being there" along side the delightful characters who, by the way, span a series of novels over the course of their lifetimes. One of the lovely gifts embedded in this series is a collection of beautiful poems set to music to represent songs of the era. Mr. Warrick, the phenomenal narrator of this story, creates some memorable tunes with his amazing voice. Do yourself a favor and download this romantic adventure. Then sit back, push play, and let the beauty wash over you. Highly recommended for all book lovers! When I write a book review, I don’t like to rehash the plot—that information is easily accessible in the book description. What I prefer is to share how the book made me feel, and what I valued between its covers. Uvi Poznansky is a literary tour de force in a contemporary age when the quality of writing often takes a back seat to the quick thrill, or to be more precise, the quick buck. She writes as she paints, with careful, vibrant strokes of amazing clarity and color. Whether you are a reader or writer, teacher or student, you owe it to yourself read her work. You will be transported to a world where life is examined from a poet’s point of view, where you live in vignettes so real that you can’t help but love and care for the characters. I have read all of Poznansky’s work, but this book resonated more deeply with me than all the previous titles, which I truly enjoyed. I suppose it is because I am an inveterate romantic. I ached for the young, “flashback” characters to come together. I shouted at them to wake up and smell the coffee when they missed opportunities to get together, and I reveled in the sweet endings when they finally connected. The atmosphere of the 1940s is beautifully portrayed, and on a secondary level only to the (mostly) unrequited love story, it was my next treasured experience while reading this book. I loved the sounds and sights of the era, the music, the cars, and the lifestyles so well depicted. It was a fascinating dip into the life of those dynamic times. If you are aching for a lyrical read, for something above and beyond the usual offerings in the field of fiction, I highly recommend you pick up a copy of Uvi Poznansky’s The Music of Us.